Chelsea and Liverpool’s new shirt sponsorship deals have helped push the combined total value for Premier League shirt deals through the £200 million-a-season barrier for the first time. The Stamford Bridge club negotiated a club-record deal worth £40m a year with Yokohama, a tyre company, starting with the coming season, while Liverpool renegotiated a five-year deal with Standard Chartered worth £25m a year. The commercial strength of the Premier League continues to pay dividends, with the overall income for Premier League clubs reaching £222.9m – up from £191.35m last year. The overall total is more than double the income generated by the German Bundesliga, the second strongest league in terms of shirt sponsorship. According to industry analysts Repucom, the 18 Bundesliga clubs have shirt deals worth £101m collectively. That’s pretty much what the Premier League deals were worth in 2010-11, five years ago. Nb: an earlier version of this graphic has been amended to correct errors. The international appeal of the Premier League is demonstrated with 14 overseas sponsors from 12 different countries, including the US, China, Thailand and Malta. 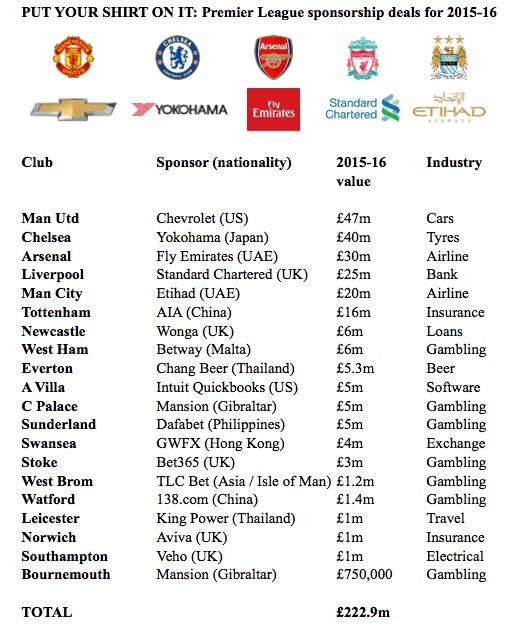 Only Liverpool, Newcastle, Stoke, Norwich and Southampton boast British-based sponsors. West Ham, Bournemouth and Crystal Palace will also carry new sponsors this season. Despite a blanket ban on gambling within football, seven club shirts will carry sponsorship from gaming companies this season. The combined value of the Premier League’s shirt deals have more than doubled in five years. In 2010-11 (details here) they were worth £100.45m; this coming season represents a 121.9% rise since then. 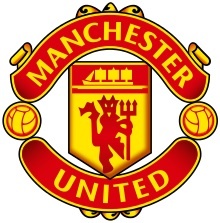 Manchester United don’t only have the biggest shirt sponsor deal in England, they also have the most lucrative kit supply deal in world football. United’s new deal with adidas, which lasts until 2025, is worth a guaranteed £70m per year, way ahead of second-placed Real Madrid’s deal, worth £30m per year. These figures come from veteran analyst Dr Peter Rohlmann and his team at the consulting bureau, PR Marketing, published for the first time today by Sportingintelligence. Premier League trio Arsenal, Chelsea and Liverpool complete the top five deals, with each club earning £28m from their kit deals. Liverpool agreed a new 10-year kit contract with US supplier New Balance this season, following a similar deal with parent company Warrior. Adidas enjoy a long-running relationship with adidas, while Arsenal are in the second year of a club-record deal with Puma. 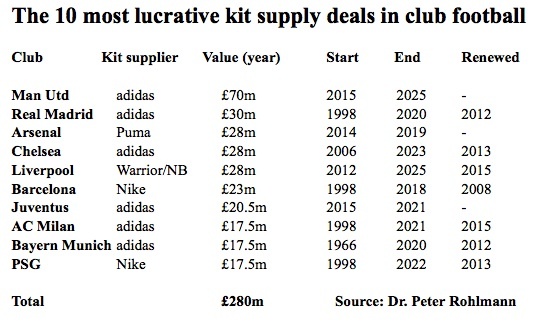 The 10 most valuable kit supply deals alone in global club football are worth a total of around £280m.